A coeducational college operated by the Society of Friends. Chartered as New Garden Boarding School in 1834. Opened in 1837. 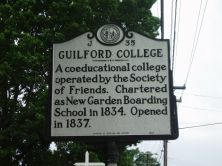 The Society of Friends chartered Guilford College, the first coeducational school in the South, and third in the nation, in 1834. First known as the New Garden Boarding School, the institute opened for students in 1837. Quakers settled New Garden in the mid-eighteenth century as well as the Centre, Springfield, and Deep River meetings. In 1781, the New Garden Meeting House served as a hospital for British and American soldiers during the Battle of Guilford Courthouse. The idea for the school originated at the New Garden Meeting House on November 10, 1830. Nathan Hunt delivered a speech concerning the paucity of educational opportunities in the Quaker community, and was seconded by Jeremiah Hubbard, a teacher in the area’s only one-room primary school. Over the next seven years, they raised $1,250 from their meeting, and received $2,400 from Friends in London and $2,600 from New York, Pennsylvania, and New England. In 1831, a tract of 170 acres was purchased, and construction began on the school. Six years later, Founders Hall, a brick building, had been completed. Quaker elders presided as the superintendents, and a series of New England teachers were hired. The school officially opened August 1, 1837, shortly after the founding of Davidson College, and a few months before Trinity College. Two years after New Garden Boarding School’s founding, Greensboro College for women opened. New Garden was coeducational, although girls and boys received their education separately. Founders Hall was partitioned into two halves, with boys on the east end, and girls on the west. Female and male students ate separately, and had segregated water pumps on opposite sides of the building. In 1888, largely as a result of the donations and work of Baltimore Quaker Francis T. King, New Garden Boarding School became Guilford College. Under the guidance of Dr. Lewis Lyndon Hobbs, the first president, Guilford College expanded its curriculum and became a school of higher education. Over the next several years, construction began on new dormitories, classroom buildings, and a gymnasium. In 1897, a gift from the Duke family provided funds for the completion of Memorial Hall. 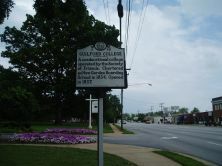 Guilford College continued to prosper in the twentieth century. In 1924, high school and preparatory classes ceased, and the school became focused solely on four-year college degrees. Presently, the college has an enrollment of nearly 1,200 students, and offers 40 academic majors. The school still maintains a close relationship with the Society of Friends. Two-thirds of the 36 trustees must be Quakers; however religious affiliation is not required of students. Guilford College remains known for its activism, with student protests a common occurrence on campus. The students carry on a tradition that has existed for nearly 150 years. During the Civil War, New Garden Boarding School served as a stop on the Underground Railroad, and in 1864 North Carolina citizens opposed to Confederate onscription protested on the campus grounds.